To a palaeontologist, the Yucatan peninsula of Eastern Mexico is a fascinating part of the world, for it was here something like sixty-six million years ago, that an extraterrestrial body crashed into the Earth which contributed to the Cretaceous mass extinction event leading to the demise of the dinosaurs. In addition, the amazing geology of the area, essentially extensive limestone deposits that over millions of years have been hollowed out in places by the action of water to create an enormous network of caverns, yields secrets of much more recent times – the remains of creatures and people that lived in America during the last Ice Age. The discovery of the remains of a teenage girl who fell to her death in a cave between 12,000 and 13,000 years ago are helping archaeologists to piece together the story of how the Americas came to be populated. The skeleton, nick-named “Naia” by the scientists, (the name means water nymph), represents the oldest genetically intact human known from the Western Hemisphere. The water nymph epithet is apt, as the when the Ice Age began to give up its icy grip on the continent around 10,000 years ago, the caves quickly became inundated with water and much of this subterranean world was submerged, including the cavern where the bones of this young girl were found. Divers carefully transport the ancient human skull. The picture above shows Divers Susan Bird (in blue) and Alberto Nava (in yellow) carefully transporting the skull to an underwater turntable so that it can be photographed from various angles to make a three-dimensional image of the human remains. Details of the research into mitochondrial DNA (mtDNA) extracted from a tooth have been published in the academic journal “Science”. Mitochondrial DNA is passed down the maternal line, from mother to daughter. The mitochondria are the “factory” areas in cells with a membrane, these convert chemical energy into food substances that can be utilised by the body. By mapping the genetic information and identifying markers within it, the girl’s ancestry can be compared with those of Native American Indian populations, helping scientists to determine how North America came to be inhabited, by whom and when. It also permits researchers to look more closely at the genetic relationships between today’s Native American population and the first inhabitants of this continent. The data supports the hypothesis that Ice Age humans who crossed from Asia into the Americas did in fact give rise to the modern Native American Indians. This means that tribes people today can trace their origins back to the very first settlers who migrated from Asia into Alaska via the landmass called Beringia that linked these two continents together. The date when people first crossed over from Asia to America is hotly debated amongst palaeoanthropologists. Some scientists suggest that migrations began as recently as 15,000 years ago. With the discovery of the human remains in eastern Mexico and their dating to circa 12,000 – 13,000, this suggests that either modern humans spread very rapidly south, or that migrations may have started much earlier. The Ice Ages led to the locking up of vast quantities of water in ice sheets. Global sea levels fell and Asia and the Americas were linked. A land bridge existed between the north-eastern tip of Siberia and the State of Alaska (Beringia), the ancestors of “Naia” crossed this land bridge and the Americas were colonised. Ancient humans crossed from Asia to America using the land bridge that is now covered by the Bering Straits. The girl, believed to have been around fifteen or sixteen years of age when she died, probably fell in the cave. The pelvis is shattered, the break suggests this was an injury caused from a fall and not the distortion of fossil material as a result of the fossilisation process. Scientists have speculated that the girl may have fallen a considerable distance, having entered the cave looking for a source of water. The divers also found a collection of other bones that represent prehistoric animals, some of which “Naia” would have been familiar with. 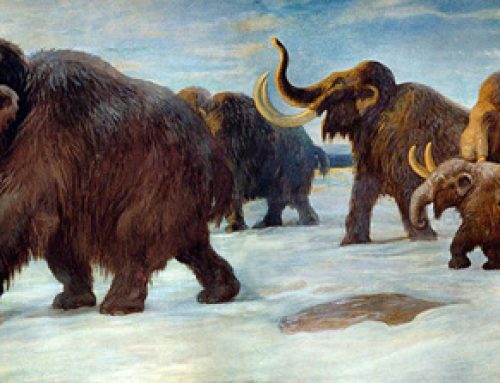 The divers found the remains of giant ground sloths, sabre-toothed cats, cave bears and a Gomphothere (extinct type of elephant). Around twelve thousand years ago, this part of Mexico was much more arid than it is today, some of the caves would have held freshwater in them, and the girl may have been part of a group of gatherers looking for fresh water supplies. Measuring under 1.5 metres tall and slightly built, the girl fell into a pit which is over thirty metres deep in places. The bell-shaped cave, now flooded is so dark and claustrophobic that the divers refer to it as “Hoyo Nero” – the black hole. The origins of the first Americans has been a source of controversy for some time. The date when the first, nomadic, hunter-gatherers crossed from Beringia remains unclear, evidence collected from early human settlements found in north-eastern Siberia (Ushki Lake and Berelekh) when compared to later human settlements in North America (Tuluaq Hill, Bluefish Caves and Swan Point) suggest that the crossings of Beringia may have taken place between 26,000 and 18,000 years ago. However, the discovery of “Naia” has confused academics as the girl had skull characteristics that distinguish her from modern Native Americans. For instance, the skull is narrower and this and the other anatomical differences led researchers to propose that the first people of the New World might represent an earlier migration from a different part of the world, than the true forebears of today’s modern Native Americans. Analysis of the mtDNA extracted from a wisdom tooth identifies the girl as belonging to the same Asian-derived genetic lineage as those of modern Native Americans. The tooth along with bone samples was used to provide an estimate of the age of the human material. Divers explore the large, submerged cave. The genetic data, although far from comprehensive suggests that the physical facial and skull differences between the first New World inhabitants and today’s Native American population probably arose due to evolutionary changes after the first migrants had crossed over from Beringia. The study was led by the Mexican Government’s National Institute of Anthropology and History supported by the National Geographic Society. In addition, to the human remains the researchers are keen to put the prehistoric mammal fossil discoveries on display once they have been prepared. Ice Age mammal bones litter the cave floor and ledges. In terms of human migration, the arrival of our species in America happened relatively recently. Homo sapiens (if we accept the “out of Africa” theory), has been steadily spreading out from Africa for the last 130,000 years or so. To read an article about the recent discovery of a H. sapiens skull in Laos that is helping to map the progress of the earliest settlers in Asia: Laos Man and the Spread of Humans into South-East Asia.